In a recent study by the University of Rochester students from grades sixth through eight were asked whether they had been experiencing any physical symptoms from computer use either at home or at school. Forty-seven percent reported wrist discomfort; 44 percent reported neck pain; 43 percent reported vision problems and 41 percent claimed to have experienced hand problems. Promoting the development of ergonomic design guidelines (or codes of practice) for software, hardware, furniture, classrooms, computer rooms, school libraries and other educational environments. The Elizabeth Blackwell Elementary School in Sammamish, Washington has initiated an innovative ergonomic program for children in which the students learn to manipulate their working environment to accommodate their own physical needs. Diane Tien, the school’s instructional technology assistant worked with leading experts in children’s ergonomics to develop the program. The program teaches the children about the importance of maintaining correct posture and minimizing awkward postures while working at the computer and encourages them to take frequent breaks from the computer. 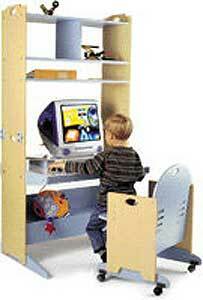 1) Michael, R. “Ergonomics for Elementary School Students” Online posting.1 July 2002.